In an earlier blog post I had covered the basic configuration involved in making a REST call using Spring Cloud which utilizes Netflix Ribbon libraries internally to load balance calls, with basic configurations like setting read timeout, number of retries etc . Here I will go over some more customizations that can be done that will require going beyond the configuration files. My use case is very simple - I want to specify the URL(s) that a rest call is invoked against. This may appear straightforward to start with however there are a few catches to consider. By default if Spring Cloud sees Eureka related libraries in the classpath the behavior is to use Eureka to discover the instances of a service and loadbalance across the instances. The big catch with the approach however is now that we have bypassed Ribbon all the features that Ribbon provides are lost - we would not have features like automatic retry, read and connect timeouts, loadbalancing in case we had multiple urls. So a better approach may be the following. One thing to note is that since the Ribbon Configuration is a normal Spring configuration it will likely get picked up as part of the @ComponentScan annotation, since this is very specific for Ribbon we would not want this configuration to be picked up this way. I have avoided that by specifying a package not in the normal classpath scan "org.bk.noscan. *" package!, I am not sure if there is another clean way to do this but this approach has worked well for me. This approach is little more extensive than the first approach, however the advantage is that once this is in place all the features of Ribbon carry over. This concludes the customizations involved in using Spring Cloud with Ribbon. If you are interested in exploring the code a little further I have this integrated in my github repo here. The customization of behavior of a Hystrix command is normally performed through NetflixOSS Archaius properties, however Spring Cloud provides a bridge to make the Spring defined properties visible as Archaius properties, this in short means that I can define my properties using Spring specific configuration files and they would be visible when customizing the command behavior. These annotations are translated using an aspect into a regular Hystrix commands behind the scenes, the neat thing though is that there is no ceremony in using this in a Spring Cloud project, it just works. Like before if the behavior needs to be customized it can be done with the command specific properties. One small catch is that the command name by default is the method name, so in my example the command name would have been "sendMessage", which I have customized using the annotation to be a different name. If you are interested in exploring this sample further, here is my github project. This is a follow up to two other posts - Motivation for why something like Hystrix is needed in a distributed systems and a basic intro to Hystrix. The properties follow an order of precedence that is explained in the wiki, here I will concentrate on ones specified through a properties file. First behavior that can be tweaked is whether to execute the command in a thread pool or the same thread of execution as the caller(SEMAPHORE strategy type). If the execution is in a threadpool, then a timeout for the request can be set. The threadpool settings are controlled using the Group Key that was specified, called default in this sample. A specific "Threadpool Key" could also have been specified as part of the constructor though. Here 10 commands can potentially be run in parallel and another 5 held in a queue beyond which the requests will be rejected. The service responds with a canned response but assume that the call was to a remote datastore. Also see that this service implements a batched method to retrieve a list of People given a list of id's. Request Collapsing is a feature which would batch multiple user requests occurring over a time period into a single such remote call and then fan out the response back to the user. There are a few things going on here, first the types in the parameterized type signature indicates the type of response(List<Person>), the response type expected by the caller (Person) and the request type of the request(id of the person). Then there are two methods one to create a batch command and the second to map the responses back to the original requests. There is far more to Hystrix than what I have covered here. It is truly an awesome library, essential in creating a resilient system and I have come to appreciate the amount of thought process that has gone into designing this excellent library. In a previous blog post I had covered the motivation for needing a library like Netflix Hystrix. Here I will jump into some of the very basic ways to start using Hystrix and follow it up with more complex use cases. Here "construct" method returns the Rx-java Observable. I have more information here. Note though that Hystrix Command is not a Singleton, the typical way to use Hystrix Command is to construct it where it is required and dispose it once done. 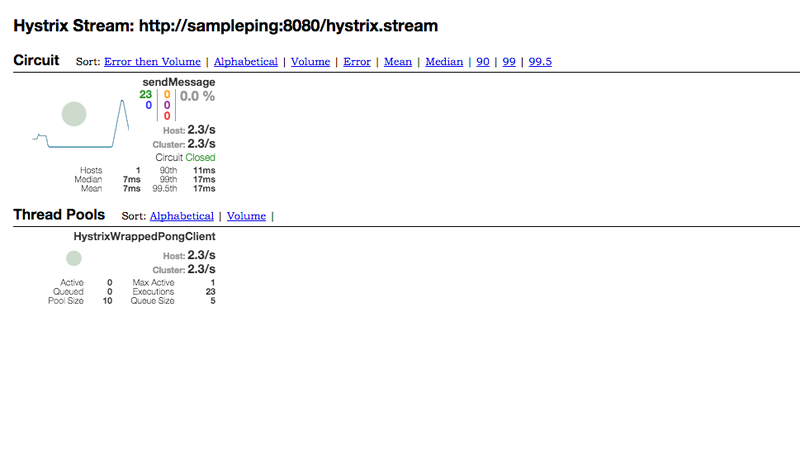 Before I wrap up the basics it is good to demonstrate an awesome feature that Hystrix packs in terms of Hystrix stream and Hystrix dashboard. 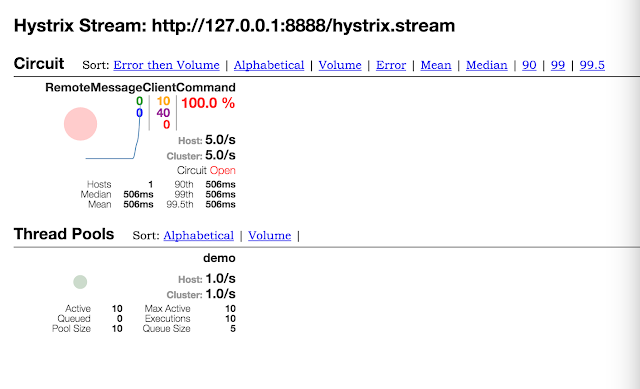 Let us start with Hystrix streams, if enabled typically as a servlet in Java based webapplications, it provides a SSE stream of realtime statistics about the behavior of the Hystrix commands present in the web application. This covers the Hystrix basics, there is a lot more to go, I will wrap this up in the next blog post with details on some of the advanced Hystrix features. override def toString = "" + numer + "/" + denom + ""
and used for extracting the numerator and denominator of the rational number! In the last few days I have been exploring the Netflix Hystrix library and have come to appreciate the features provided by this excellent library. There are a whole lot of keywords to parse here, however the best way to experience Hystrix in my mind is to try out a sample use case. The service takes in a payload, but additionally takes in two fields - delay_by which makes the service acknowledge a response after the delay in milliseconds and a "throw_exceptions" field which will result in an exception after the specified delay! At this point we have a good candidate service which can be made to respond with an arbitrary delay and failure. I have multiple endpoints which delegate calls to this remote client, all of them expose a url pattern along these lines - http://localhost:8888/noHystrix?message=Hello&delay_by=0&throw_exception=false, this first one is an example where the endpoint does not use Hystrix. As a first example, consider calls to the Remote service without Hystrix, if I were to try a call to http://localhost:8888/noHystrix?message=Hello&delay_by=5000&throw_exception=false or say to http://localhost:8888/noHystrix?message=Hello&delay_by=5000&throw_exception=true, in both instances the user request to the endpoints will simply hang for 5 seconds before responding. 1. If the service responds slowly, then the client requests to the service will be forced to wait for the response to come back. 2. Under heavy load it is very likely that all threads handling user traffic will be exhausted, thus failing further user requests. 2. If the service were to throw an exception, the client does not handle it gracefully. Clearly there is a need for something like Hystrix which handles all these issues. What happened here is that the first 10 requests timed out, anything more than a second by default times out with Hystrix command in place, once the first ten transactions failed Hystrix short circuited the command thus blocking anymore requests to the remote service and hence the low response time. On why these transactions were not showing up as failed, this is because there is a fallback in place here which responds to the user request gracefully on failure. The purpose here was to set the motivation for why a library like Hystrix is required, I will follow this up with the specifics of what is needed to integrate Hystrix into an application and the breadth of features that this excellent library provides. 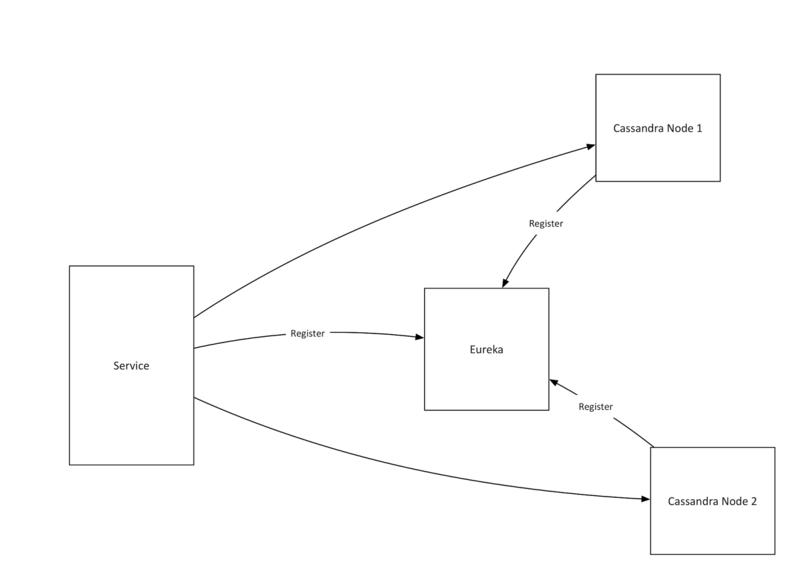 In the last blog post I had described how the Sidecar application can be used for registering the Cassandra nodes with Eureka and more generally can be used for registering any non-JVM application with Eureka. In this post I will cover how an application can go about querying the Sidecar registered nodes. These would print the nodes registered with a name of "samplecasssandra.vip" VIP. Now if an application needs to discover the nodes during initialization the flow is a little more complicated, for a potential issue look at this ticket. The DiscoveryClient is initialized very late in the Spring Lifecycle and if DiscoveryClient is used in any post-processing activity of a bean it is likely to give an exception. Here CassandraTemplate is being overridden to prevent the check in afterPropertiesSet method that a Cassandra session exists, as a session will be established much later in the start-up cycle. This way the Cassandra session can be created very late in the cycle. Somewhat rough, but the approach works. If you are interested in exploring this sample further I have this code available in my github repo here. There are a few interesting ways to make REST client calls with the Spring-Cloud project. Spring-Cloud rest support builds on top of the core Netflix OSS libraries, but abstracts them and in the process simplifies using the libraries. In this specific instance, the host part of the url is expected to be completely known to the client, RestTemplate will take care of marshalling the Java object to the appropriate media type, making the REST call, and unmarshalling the response back to a Java Object. Netflix Ribbon provides a library for making REST based calls, whereas with RestTemplate the host is expected to be completely known to the client, with Ribbon the host is typically resolved through the Centralized Netflix Eureka server and Ribbon takes care of load-balancing the calls if multiple hosts are found for a service. If Spring-cloud libraries and Ribbon related libraries are present in the classpath, then Spring-Cloud enhances RestTemplate to be based on Ribbon instead with no additional configuration required, with Spring-Cloud in place the call would exactly like before, with a few twists. The twist is that the hostname which in this instance is "sample-pong" is significant, it is not the real host name - instead, an attempt is made to find the list of servers with this name as the registration name in Eureka and the resulting host/port is used for making the request. Ribbon is a fairly complicated low-level way of making a REST call, RestTemplate abstracts the Ribbon implementation and makes it look easy from a clients perspective. The annotations are Spring specific though, Spring-Cloud facilitates this by adding in encoders and decoders which support Spring MVC annotations. @FeignClient annotation on the interface identifies this a FeignClient code. @EnableFeignClients is required in a Spring Configuration to load up all such FeignClient's. A neat thing about Couchbase Java SDK is that it is built on top of the excellent Rx-Java library, this enables a reactive way to interact with a Couchbase server instance which is very intuitive once you get the hang of it. The return type of the insert is an Observable, so if I needed to map the return type back a KeyVal I can use the extensive mapping support provided by Observable class. I wanted to explore an approach which Spring framework recommends for handling static web resources, which is to use these very capable build tools for building the static assets and using Spring for serving out the content once the static assets are built into a distributable state. My approach was to use yeoman to generate a starter project, I chose the gulp-angular as my base and quickly generated a complete project, available here. I was able to expand this template into a fairly comprehensive angularjs based single page application which delegates back to Spring based REST calls to service the UI. If you want to follow along the end result is available in my github repo. Define two modules, the "client" module to hold the generated yeoman template and a "server" module to hold the Spring Boot application. Spring Cloud provides all the tools that you require to create cloud ready microservices. One of the infrastructure components that Spring-Cloud provides is a Configuration server to centralize the properties of an application, however it is possible that you that you may be using other solutions to manage the properties. One such solution is Netflix Archaius and if you work with Netflix Archaius there is a neat way that Spring-Cloud provides to integrate with it. Not that the version of the dependency need not be specified, this information flows in from the dependency management information in the parent POM’s. Spring Cloud natively provides all the tools to write a Cloud Ready microservice, however it is possible that the way to configure the centralized properties may be via Netflix Archaius, if that is the case Spring Cloud enables this neat way to integrate with Archiaus. It has taken me a little while, but I do like the hierarchical look of the properties described in a yaml format. Note the placeholder for "prefix.stringProp" key. This however is not ideal for loading a family of related properties, say in this specific case namespaced by the prefix conveniently named "prefix". At runtime, all the fields would be bound to the related properties cleanly. Additionally note the JSR-303 annotations on top of the "intProp1" field that validates that value of the field is between 0 and 99, @ConfigurationProperties will call the validator to ensure that bound bean is validated. If you are interested in exploring this sample further, I have a github repo with the code checked in here. The dependencies are not injected in cleanly. Looking at the Karyon2 samples, both of these issues are actually very cleanly addressed now which I wanted to document here. This is essentially it, now the routing logic is cleanly separated from the processing logic. Continuing my Spring-Cloud learning journey, earlier I had covered how to write the infrastructure components of a typical Spring-Cloud and Netflix OSS based micro-services environment - in this specific instance two critical components, Eureka to register and discover services and Spring Cloud Configuration to maintain a centralized repository of configuration for a service. 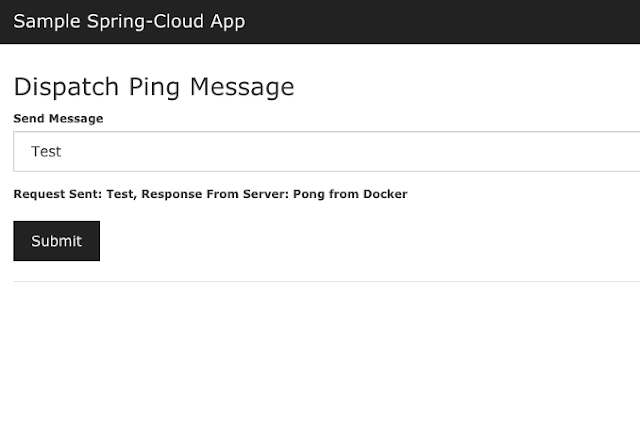 Here I will be showing how I developed two dummy micro-services, one a simple "pong" service and a "ping" service which uses the "pong" service. The location of Eureka is specified through the "eureka.client.serviceUrl" property and the "spring.cloud.config.discovery.enabled" is set to "true" to specify that the configuration server is discovered via the specified Eureka server. Just a note, this means that the Eureka and the Configuration server have to be completely up before trying to bring up the actual services, they are the pre-requisites and the underlying assumption is that the Infrastructure components are available at the application boot time. and that completes the code for the "pong" service. 1. Use raw Eureka DiscoveryClient to find the instances hosting a service and make calls using Spring's RestTemplate. 3. Use Feign, which provides a declarative way to invoke a service call. It internally uses Ribbon. 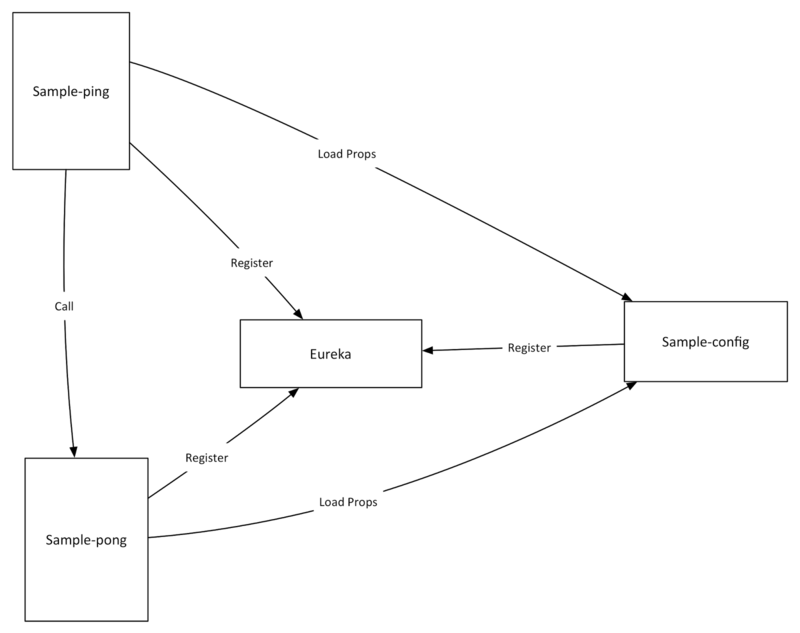 The most important entry here is the "samplepong.ribbon.DeploymentContextBasedVipAddresses" which points to the "pong" services Eureka registration address using which the service instance will be discovered by Ribbon. Now, the execution has moved away from the main thread and the emissions and the subscriptions are being processed in the threads borrowed from the threadpool. The emissions are now back on the main thread but the subscriptions are being processed in a threadpool. That is the difference, when subscribeOn is used the emissions are performed on the specified Scheduler, when observeOn is used the subscriptions are performed are on the specified scheduler! Now the threads in the threadpool are being used uniformly.